Fresh and packed with flavor! The warmer weather has me craving salads… big, hearty salads! 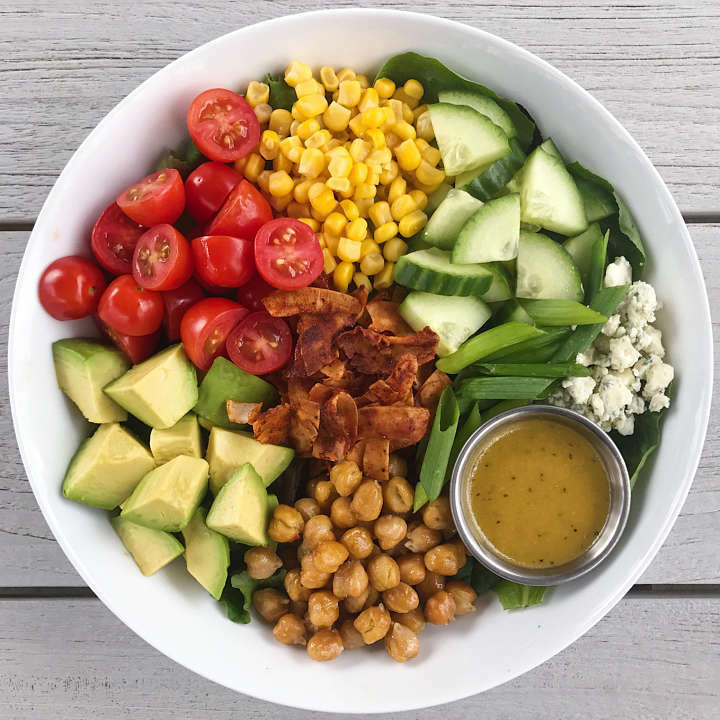 Enter this Vegetarian Cobb Salad which will be on repeat all spring and summer for sure! Tomatoes, corn, cucumbers, blue cheese, roasted chickpeas, avocado and crispy coconut bacon (crazy good! ), on a bed of mixed greens, all tossed in a Lemony Dijon Vinaigrette. It’s perfect mix of savory, salty and tangy and it’s DELISH! More on the Crispy Coconut Bacon… Recipe from Minimalist Baker, it’s an amazing vegetarian substitute for bacon. It has that crispy texture and salty, smoky taste and is seriously addictive! It’s also super simple to make taking just about 15 minutes and making a large quantity. The best part of this or any Cobb Salad is the it’s so adaptable to tastes. Add hard boiled eggs, or grilled chicken, skip or substitute the cheese, or use real bacon instead of the vegan substitute. Any way, it’s a delicious, satisfying meal. This hearty, vegetarian version of the classic salad is sure to become a Spring and Summertime favorite! It's fresh and packed with flavor! The perfect mix of savory, salty and tangy. Tomatoes, Corn, Cucumber, Blue Cheese, Roasted Chickpeas, Avocado and homemade Coconut Bacon all tossed in a Lemony Dijon Vinaigrette with some mixed greens. Coconut Bacon recipe from Minimalist Baker. Optional adds: hard boiled eggs, grilled chicken. *As the name suggests, liquid smoke adds a hint of smokiness to this recipe. It helps provide that "bacon-y flavor"! I found it both online and at the supermarket. Most brands I looked at were gluten-free. I used Colgin Brand. Mix oil, tamari, paprika, maple syrup, liquid smoke, sea salt, and black pepper in a medium bowl. Add coconut flakes. Toss/stir to thoroughly coat. Place coated coconut flakes on prepared baking sheet. Bake at 325°F for 6 minutes, then stir and flip pan around. Bake for another 5-7 minutes, or until coconut bacon is crispy and golden brown. Watch carefully in the last minutes of cooking and be careful not to burn as it can go from brown to burnt very quickly. Let cool for 10 minutes - it will continue crisping as it cools. Place chickpeas on baking sheet and toss with a small amount of olive or avocado oil. Sprinkle with salt to taste. Bake 15-25 minutes. I prefer them only slightly crisp so usually remove at about 15 minutes. For crispier chickpeas, cook 20-25 minutes. Whisk all ingredients in a liquid measuring cup or small bowl until well combined. Save extra in an airtight container in the refrigerator for several days. In each bowl, place 1 heaping cup or more mixed greens. Top with tomatoes, corn, cucumbers, blue cheese, roasted chickpeas, avocado, and crispy coconut bacon. Drizzle with Lemony Dijon Vinaigrette to taste.